This length of trip is ideal for anyone new to Deep Sea Charter Fishing, as well as anyone just wanting to get out on the ocean for a few hours for a bit of fishing. 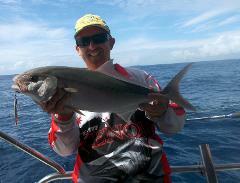 The short duration of the charter does of course limit the distance we are able to travel to the fishing locations. In general we travel up to 8 Nautical Miles off the coast on this charter. Small reefs and crops are fairly abundant in these areas, attracting a wide array of species. This is not the charter we recommend for the more seasoned fishing enthusiast. Particularly not those seeking that large offshore or career size fish. We need much deeper waters and larger reef structures which are simply a lot further from shore. If this sounds like you please look at our 9 or even our 11 hour charters! Whilst on board you are welcome to enjoy the use of a wide variety of types of rods, reels and bait. Snacks, soft drinks and water are supplied throughout the trip. Our 55 ft vessel, Crusader 1 is surveyed for a maximum of 25 persons. On mixed groups we try keep it to around 18 people + crew to give you the maximum amount of room to move around the boat and fish comfortably. We have 2 electric marine toilets, one kept soley for the ladies, along with the most up to date electronic safety and navigation equipment. We depart from The Public Boat Ramp - Parkyn Parade, Mooloolaba. We recommend this length of trip to those relatively new to Deep Sea Charter Fishing, or those just wanting to get out on the ocean for a few hours and try their hand at a bit more fishing than the 5-hour charter allows. The medium duration of this charter does still somewhat limit the actual amount of time available for fishing as well as the distance we are able to travel to the fishing locations. In general we travel up to 15nm offshore on this charter. More experienced fishing enthusiasts should strongly consider 9 or 11 hour Charters or even an Evening or Night fishing Charter. Enjoy the use of a variety of types of rods, reels and bait. Snacks, unlimited soft drinks and bottled water are supplied throughout the trip. We depart from The Boat Ramp - Parkyn Parade, Mooloolaba. Enjoy the use of a variety of types of rods, reels and bait. Snacks, unlimited soft drinks and bottled water are supplied throughout the trip. We even include a fresh lunch, and platters for you! Our 55 ft vessel, Crusader 1 is surveyed for a maximum of 25 persons. On mixed groups we aim to keep it to around 18 people + crew so as not to overcrowd our charters and to give you plenty of room to move around the boat comfortably. We recommend this length of trip to the more experienced fishing enthusiasts. Enjoy the use of a variety of types of rods, reels and bait. Snacks, unlimited soft drinks and bottled water are supplied throughout the trip. We even include a fresh lunch, antipasto and fruit platter for you as well. “CRUSADER I” is the perfect deep sea fishing platform for overnight fishing with quality big fish tackle (fishermen are always welcome to bring their own equipment f course) and plenty of deck space to use it. With a maximum of just 12 people on a vessel that normally takes up to 22 in comfort you will have more space than you have ever imagined on a fishing boat. Add in the fact she is fully set up with the low level blue deck lighting and underwater “Squid-lights”, and you know this is true night fishing at it’s ultimate! The additional time means we can travel further, to remote parts of the reef that have much less fishing pressure. These locations offer far less exploited fishing potential in locations that are rarely accessed by other vessels. With distances of up to 35NM (70 Kilometres) offshore you’re really out there amongst it. 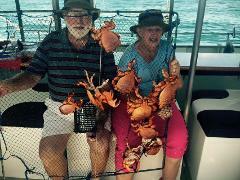 Departing from Mooloolaba at 3PM, we steam out to the fishing grounds, trolling on the way. After a few hours, the crew will put you on the spot to hook up an assortment of reef fishing species such as Spanish mackerel, coral perch, cod, red emperor, jewfish, snapper, tuna, trevally and kingfish. And whilst you battle the a wide variety of fish species, you will enjoy sunset nibbles, drinks and a delicious barbecue dinner. We may even be able to add a nice fresh fish to the BBQ dinner spread if all goes to plan! Sunset drinks whilst catching more fish with mates is hard to beat, best of all when there is usually not another boat in sight in these locations. Keep fishing, when you know that most other boats are heading in and missing out on that sunset prime fishing bite. As the night progresses, the choice is yours, either curl up in a bunk for a couple of hours sleep, or for the really keen fisherman, stay up and fish all night! Different fish species take over as the night progresses keeping you on your toes if you are up to the challenge. 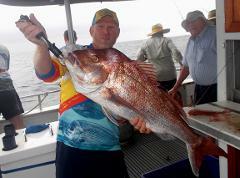 Finally experience true Sunrise deep sea fishing on the tropical waters of the Sunny Coast. This first light fishing usually results in something special to write home about! You'll enjoy a hearty toast, bacon and egg breakfast, or cereal if that is your preference, as we steam back home. Not to mention an espresso coffee to make sure you are still wide awake should we hook on to another big one on the troll! Kayak fishing is fast becoming such a popular outdoor activity. Experience the exhilaration of fishing with soft plastic & hard bodied lures whilst surrounded by the stunning natural beauty of our dams, rivers, & estuaries. You guided Kayak Fishing Tour will include tips and assistance on estuary and dam fishing. Designed for groups of 4-7 people, experience the amazing fishing and sight seeing opportunities as you either cruise or target species such as Bream, Flathead, Snapper and Bass to name a few. Your guide is very experienced. Tours are conducted on calm water and are suitable for people with a moderate degree of fitness. This tour is for 4 hours and includes refreshments and all equipment. You will have a pack which includes a fishing rod and reel and lures to take home. This value alone is well in excess of $150.00 plus enjoying the 4 hour kayak tour.